Shopping for car audio upgrades is as personal as shopping for a new car or new shoes. Each of us likes something different, has a different budget and different performance and style preferences. In the case of a new car, your options range from a solid and reliable daily driver in the $14,000 range to luxury and exotic vehicles costing well over $100,000. When it comes to a new radio, speakers, an amplifier or a subwoofer upgrade for your car, the price point differs just as much, as do the features and performance levels. In this article, we will provide some tips to prepare yourself to buy new car audio upgrades and ensure they are installed and configured reliably. A discussion about online shopping opens a monumental can of worms. One of the biggest differences between buying from an online retailer and a local independent specialist will be the level of after-sales service and support. If you buy new speakers online and you have a problem with them, you can try contacting the supplier. About all they can do is offer to let you send the speakers back (at your cost) and they will send you another set. When you deal with a local retailer, someone can go to your car and listen to the problem. The issue may not be the speakers at all. It could be the source unit, an amplifier or an installation issue. Likewise, if you buy something online and it doesn’t fit your vehicle, you will have to send it back (again, at your expense). If you buy speakers from a local shop, they can make sure you get the right size and that the units they install function perfectly. Make no doubt, most of the installers, technicians and fabricators who work at mobile electronics retailers got their start working on their vehicles in their driveway. In some cases, this passion for working on cars and trucks grew to include their friends’ vehicles, while others sought out training from companies like Installer Institute, Kingpin University, Mobile Solutions, or in the good old days, Mobile Dynamics. Whether an installer had formal training or extensive hands-on experience, most of them have continued to hone their skills and knowledge through ongoing training to deal with data network integration, handle factory audio systems with advanced tuning and learn about new cool and unique fabrication skills. Whether you decide to pay for the expertise of a professional or attempt to install something yourself comes down to your comfort level. If you feel you can do the work safely and reliably, then, by all means, give it a try. If you don’t know how to access and confirm the correct wire connections, make electrical connections securely and safely and mount equipment in a way that ensures maximum performance and reliability, then ask your local shop to do the work. Don’t get in over your head, though; it’s easy to break plastic trim panels or short wires and damage electronic modules. When it’s time to head out and shop for new audio equipment for your vehicle, you’ll need to bring a few items with you and do a little planning. First, you need to decide on a budget. How much money do you want to spend on the product? Set yourself two levels for this decision: an ideal price and an absolute maximum price. What if you’ve allowed $800 for a set of speakers, but you hear a set priced at $1,000 that sounds amazing? Leave yourself some wiggle room. *Many new vehicles use data connections between the factory radio and amplifier. To upgrade either of these components, you may need to purchase a data interface module. These modules need to programmed for the specific make, model and trim level of your vehicle to function properly. When it comes to source unit upgrades, the first thing you need to find out is whether or not you can replace the factory radio in the vehicle at all. Vehicles such as BMW, Mercedes-Benz, Mazda and many new Nissan vehicles have source units that can’t be removed. Once you have determined that you can replace the radio, you need to determine the features you want to add. These will depend on how old your vehicle is. Many new radios include Bluetooth for hands-free calling and audio streaming, HD Radio tuners and playback of MP3, WMA, AAC, WAC and FLAC digital audio files. If you choose a multimedia radio, the system may also play MPG, AVI and MKV video files, and it may include an input for a backup camera. Navigation is a very popular feature on multimedia radios, as is smartphone integration. Features like Android Auto and Apple CarPlay have been the most popular reason people upgrade their radios over the last few years. Perhaps the most important component in an audio system is the speakers. Speakers are the only link between your music source (radio, USB stick, streaming service or smartphone) and your ears. The quality of your speakers will determine the accuracy of your audio system. A speaker that produces a lot of distortion will color your music, detracting from the detail and realism of the listening experience. Auditioning speakers can be difficult, especially in an environment other than a car. What you can tell is the difference between one speaker and another. Listen for clarity and detail rather than overall tonal balance. Does a brush on a cymbal sound real or like sandpaper on a piece of steel? Do the highs blend realistically with the midrange and midbass region? Is the bass taut with great impact or sloppy and resonant? The differences you hear on a display board will remain consistent once the speakers are installed in your vehicle, even if the overall tonal balance changes. Amplifiers such as this JL Audio VXi model contain on-board processors. Choosing one amplifier over another can be difficult. Most people buy amplifiers based on power ratings. You don’t need a 400-watts-per-channel amp for your midrange drivers; 50 to 100 watts is usually quite adequate. For subwoofers, well, power is fun. Too much power can lead to damaging your speakers. If you never, ever want to damage a speaker, choose an amp rated for half of the continuous power rating of your speakers and subs. If you can control yourself and know when to turn down the volume if you hear distortion, you can choose an amp that offers the same power as the speaker is rated for. Use only the continuous power ratings on your speakers, not those bogus “max power” numbers. Signal processing has become a lot more important and readily available in the last few years. As more and more shops learn how to quickly and efficiently tune an audio system using a DSP, consumers continue to reap the benefits of improved accuracy and realism from their sound system. If your budget can handle it, include a digital signal processor in your upgrade and make sure the system is designed to maximize the features offered by that unit. When you go shopping, bring one or two pieces of music that you know well. Before you leave your house, listen to that song on as many different sources as possible: your home theatre system, a portable Bluetooth speaker, headphones with your smartphone and your existing stereo. Think about what is different between each experience so you can listen for those elements as you audition new products. It will sound strange, but bring the vehicle you want to upgrade with you. Don’t bring your wife’s car. Many shops will want to look at your vehicle to confirm speaker sizes and the available space for equipment installation, and some salespeople will want to sit in the car with you to learn more about how you listen to your music. Seeing EQ or tone control adjustments you have made can provide a great deal of insight into future upgrades. Not every car stereo shop is ideal for every type of project. Needing a new radio in a 1990 Honda Civic does not require the same skill as fabricating a set of speaker pods for in the A-pillars of a Tesla Model 3. Part of your shopping process is to quantify the skills and capabilities of the shop to find out whether they have the experience and tools required to do the work you want. 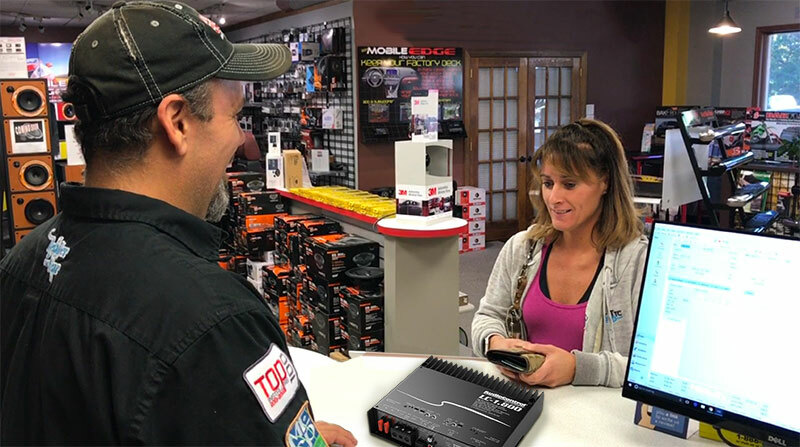 Specialist Mobile Electronics retailers have typically invested tens of thousands of dollars in tools and training so that their staff is ready to take on any challenge. You can also learn a lot about a shop by the kinds of questions the sales teams ask you and the type of information they provide. If the salesperson is reading features off of the box the product comes in, they may not be genuinely qualified to provide you with the exact solution you need. True experts in the industry dedicate hundreds of hours each year to learning about the products they sell to make sure they offer excellent value and reliability. If the shop you are visiting has a demo vehicle, ask to have a listen. Even if you have a modest budget, you can learn a lot about the shop’s capabilities by listening to a demo car and looking at the work they have performed. Looking at wiring around amplifiers and the battery is a great way to understand their level of commitment to doing great work. We could go on for another 10,000 words about how to shop for car audio equipment. This article serves as a primer for the experience and to give you a few ideas about what to look for. Visit your local mobile electronics retailer and listen carefully to their advice.